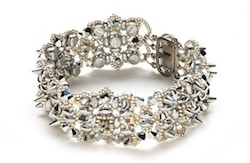 Crystal crossings bracelet by Jackie Schwietz Page 23 Embellish a peyote-stitched base with crystals and pearls to accent an exquisite bracelet. 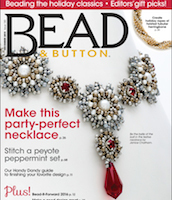 Festive by design necklace by Janice Chatham Page 26 Combine popular stitches to create a party-perfect necklace glimmering with pearls and rose montées. 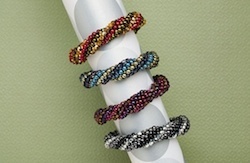 'Tis the season to twist bracelet by Cara Landry Page 30 Stack your wrist with ropes of twisted tubular herringbone showcasing your favorite holiday hues. 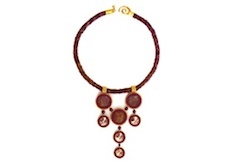 Elegance with an attitude by Nicole Vogt Page 36 The monochromatic colors and spike beads bring texture and dimension to this sophisticated bracelet. 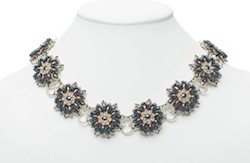 Winter garden necklace by Gianna Zimmerman Page 40 Beautiful floral components come together for an exceptional necklace just right for any occasion. 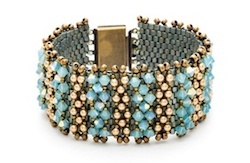 Crystallized square bracelet by Maria Teresa Moran Page 48 A sturdy right-angle weave base is adorned with QuadraTiles and seed beads, and capped off with crystals for over-the-top endless sparkle. 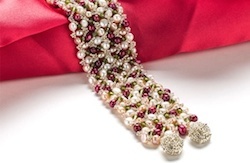 Holiday garland bracelet by Jeanette Dailey Bobby Page 60 Relive days gone by with a bracelet reminiscent of an old-fashioned popcorn-and-cranberry garland. 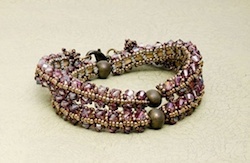 Twice as nice bracelet by Cary Bruner Page 64 Work in right-angle weave around a leather cord to make this stunning double wrap bracelet embellished with sparkling crystals. 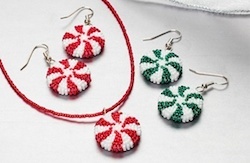 Peppermint delights set by Lane Landry Page 68 Cook up fresh and minty swirled beaded beads into a cut jewelry set that gives the impression you're wearing real peppermint candy! 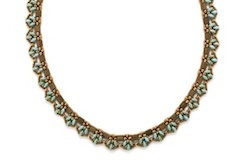 Pinnacle lace necklace by Renee Kovnesky Page 72 Two-hole beads add detail and elegance to this delicate collar-style necklace. 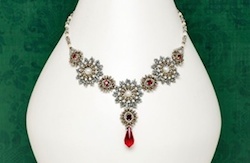 Second Look. 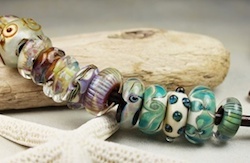 Variations on a theme By Margie Deeb Page 19 Discover how to hone your design skills through creative exploration. Artist Profile. 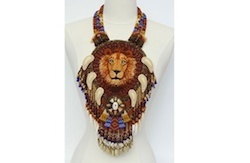 Andrea Grzabka By Page 46 Andrea Grzabka expresses a lifelong love of animals with award-winning bead-embroidered jewelry. Artist Spotlight. Stephanie Dieleman By Julia Gerlach Page 90 Lampworker and artist Stephanie Dieleman lives and teaches the life creative.